Go through the village of Auchmithie and follow the road to the end where it turns north away from the village and there is a path that runs between fields. Follow this track towards Rumness on the map and then on towards Ethie Barns.You can then drop down to the village of Ethie Haven which lies at the bottom of the cliff or carry on towards Corbie Knowe which is situated at the south end of Lunan Bay. 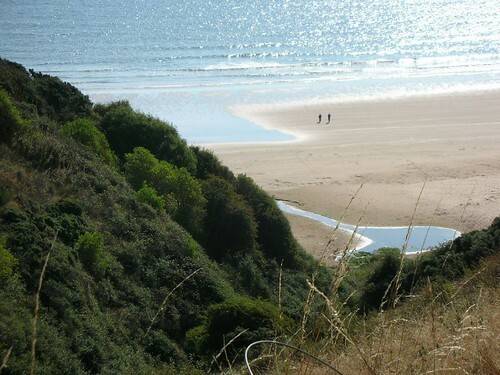 Walk along the beautiful beach of Lunan Bay and then either ford the Lunan water stream or carry on past Red Castle which stands on a headland above the beach. From there it is a short walk aliong to the car park at Lunan Bay where this walk ends. I had expected to walk from Auchmithie to Montrose today but as I set off from Auchmithie I felt really rough and weak for some reason. Rather than risk feeling like that for the whole way, I decided to change my plans and only walk the 6 miles to Lunan Bay instead. It meant getting back into my camper van and driving north to get my bike that I had left at Montrose and bringing it back to leave it at Lunan bay, before starting the walk again. Im glad I did that however because even although the walk and bike ride together only amounted to about 14 miles, I still felt knackered at the end of it. Especially as there was a huge wind in my face coming back along the road towards Auchmithie. The highlights of this walk had to be the beach at Lunan Bay, which stretched in a large sweeping bay from Ethie Haven in the south towards Buckiemill in the north. It was a beautiful warm day and the sunshine and the waves lifted my spirits considerably. Lunan Bay has to be one of the loveliest beaches I have been to along the way so far. You are currently browsing the Scottish Coastal Walk blog archives for the day Tuesday, September 6th, 2005.